At least I've chosen to color some details with a specific color for every character following a rainbow order. Hope someone could like it. woa! that's great! good job! congratulations! your jod is nice y cool ^^ great! the hell!.... Why i dont have this as a favorite?!?!?!? Well... i have it now! And u're directly goin to my watchlist! definetly! thanks a lot for sharing this ONE PIECE! Found this one at master blood. Was lured into the site because someone mentioned Nico Robin! Great job Sam the final result is beautiful. thanks for giving us color option! the black and white is cool but the rainbow really knocks me off my shoes. Love the image choices you choose for each person! If possible can you do one with the whole strongworld theme with this kind of style? I think thatd really work on well because luffy looks so awesome when he has that black jacket on. wow, the b/w is great, but it is more great yet! 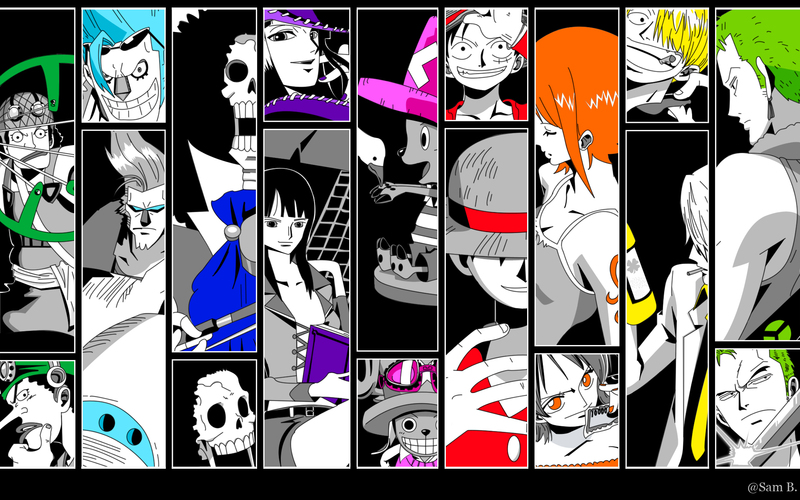 group of straw hat luffy. yup!